Thanks to an anonymous donor, all gifts during November 2018 are matched up to $12,000! Thanks to the incredibly generous community of MN Sinfonia supporters, we are already at 80% of our goal. 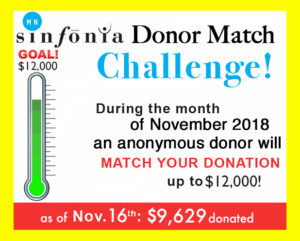 Please consider donating today to help meet the challenge AND ensure free MN Sinfonia classical concerts continue to entertain, educate, and excite Minnesotans. MN Sinfonia donors are the best! Thanks to each and every one of you for supporting free-admission concerts and school programs.